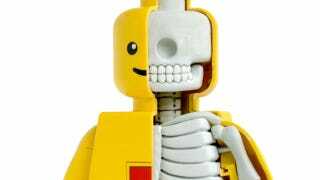 Artist Jason Freeny, who you may have seen here once or twice before, shows the world what the inside of a LEGO Minifig looks like. Rather than being a small collection of horrors, it is predictably adorable, everything clean and smooth, everything in its place. Kinda freaky teeth, though. That's a lot of them for something that doesn't really need to eat.